Listen: come with me. Well set off from the Queens Head at Blyford, a fine and welcoming pub across the road from that villages little church. Perhaps well have just had lunch, and well be sitting outside with a couple of pints of Adnams. Youd like to stay there in the sunshine for the rest of the afternoon, but Im going to take you somewhere special, so stir yourself. You are probably thinking it is Holy Trinity at Blythburgh, Suffolks finest church a couple of miles away on the main A12. But it isnt. Nor is it St Andrew at Wenhaston, a mile away across the bridge, and home of the Doom, one of Suffolks greatest medieval art treasures. Youve already seen that. No. Within a few miles of the pub sign (notice that it features St Etheldreda, whose father King Anna was killed in battle on the Blyth marshes) there is a third of Suffolks finest churches. It is the least known of the three, partly because it is so carefully hidden, so secreted away, and partly because Simon Jenkins, inconceivably, unforgivably, missed it out of his book Englands Thousand Best Churches.This may yet have serious consequences, as we shall see. Blyford is on the main road between Halesworth and Dunwich, but we are going to take a narrow lane that you might almost miss if you werent with me. It leads northwards, and is quickly enveloped by oak-buttressed hedgerows, beyond which thin fields spread. Pheasants scuttle across the road in front of us; a hare watches warily for a moment before kicking sulkily back into the ditch (we are on foot perhaps, or bicycle). Occasional lanes thread off towards the woods and the sea. After a couple of miles, we reach the obscenity of a main road, and cross it quickly, leaving it behind us. Now, the lane narrows severely, the banks steepening, trees arching above us. They guard the silence, until our tunnel doglegs suddenly, and an obscure stream appears beyond the hedgerow. Once, on a late winter afternoon, my dream was disturbed here by a startled heron rising up, its bony legs clacking dryly as it took flight over my head. I felt the rush of its wings. This road was not designed for cars. Instead, it traces the ancient field pattern, cutting across the ends of strips and then along the sides, connecting long-vanished settlements. The lane splits (we take the right fork) and splits again (the left) and suddenly we are descending steeply into a secret glade shrouded in ancient tree canopies. The lane curves, narrows and opens  and here we are. Still, you might not notice it, because the church is still camouflaged by the trees, and the absurdity of the neighbouring bungalow with its kitschy garden may distract you; but to your right, in a silent velvet graveyard sits St Andrew, Westhall. It has been described in one book as Suffolks best kept secret. I hope that I can convey to you something of why this place is so special. Firstly, notice the unusual layout of the building as you walk around it. That fine late 13th century tower, not too high despite its post-Reformation bell-stage, organic and at one with the trees; the breathtaking little Norman church that spreads to the east of it. And then, to the north, a large 13th century nave, thatched and rustic. It was designed for this graveyard, for this glade. Neither has changed much. Beyond it, the grand 14th century chancel, rudely filling almost the entire east end of the graveyard. Perhaps as we step around to the north side the same thing will happen as happened to me one muggy Saturday afternoon in July 2003  a tawny owl sat watching me on a headstone, and then threw itself furiously into the air and away. Your first thought may be that here we have two churches joined together  and this is almost exactly right. You can see the same thing on a similar timescale at Ufford, although the development there is rather more subtle than it is here. 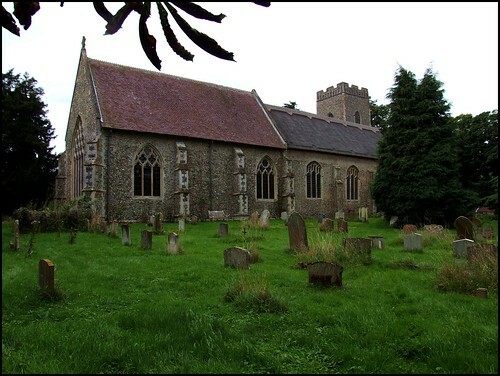 Here at Westhall, there was a Norman church  an early one. Several hundred years later a tower was built to the west of it, and then the vast new nave to the north. A hundred years later came the chancel. Perhaps the east end of the Norman church was rebuilt at this time. Mortlock thinks that there was once a Norman chancel, and this may be so. The old church became a south aisle, the particular preserve perhaps of the Bohun family. They married into the famous Coke family, who we have already met at nearby Bramfield. And so, we step inside. We may do so through the fine north porch; it is a wide, open one, clearly intended for the carrying out of parish business. It was probably the last substantial part of the church to be built, on the eve of the Reformation. The door appears contemporary. Or, I might send you round to step in through the Norman doorway on the south side, into the body of the original church. You expect dust and decay, perhaps, in such a remote place. But this is a well-kept church, lovingly maintained and well-used. Although there are a couple of old benches scattered about, most of the seating is early 19th century, with that delightful cinema curve to the western row which was fashionable immediately before the Oxford Movement and the Camden Society sent out their great resacramentalising waves, and English churches were never the same again. If you step in from the south, then you are immediately confronted with something so stunning, so utterly wonderful, that we are going to pretend you cannot believe your eyes, and you pass it by. Instead, draw back the curtain, and step into the space beneath the tower. Walk to the western wall, and turn back. You are confronted with the main entrance of a grand post-conquest church, probably about 1100. Surviving faces in the unfinished ranges look like something out of Wallace and Grommit. Above, an arcade of windows, the central one open. Almost a thousand years ago, it would have thrown summer evening light on the altar. As you step back into the aisle, it is now easy to see it as the nave it once was. The northern wall has now gone, replaced by a low arcade, and you step through into the wideness of the modern (it is only 600 years old!) nave. Here, then, let us at last allow ourselves an exploration of Suffolks other great medieval art survival. This is Westhalls famous font, one of the seven sacrament series, but more haunting than all the others because it still retains almost all its original colour. The Mass panel is the most familiar, because it is the cover of Eamonn Duffys majestic The Stripping of the Altars. The other panels, anti-clockwise from this, are Last Rites, Reconciliation, Matrimony, Confirmation, Baptism, Ordination, and the odd panel out, the Baptism of Christ. The font asks more questions than it answers. How did it survive? Suffolk has 13 Seven Sacrament fonts in various states of repair. Those nearby at Blythburgh, Wenhaston and Southwold are clearly from the same group as this one, but have been completely effaced. Other good ones survive nearby at Weston and Great Glemham, at Monk Soham, at neighbours Woodbridge and Melton, neighbours Cratfield and Laxfield, at Denston in the south west and at Badingham. We dont know how many others there might have been; probably not many, for most East Anglian churches have a surviving medieval font of another design. The surviving panels were probably plastered over during the long puritan night (the damage to the figures is probably a result of making the faces flush rather than any attempt at iconoclasm) but they were also all probably once coloured. So why has only this one survived in that state? The other feature of the font that is quite, quite extraordinary is the application of gessowork for the tabernacled figures between the faces. This is plaster of Paris which is moulded on and allowed to dry  it can then be carved. It is sometimes used on wood to achieve fine details, but rarely on stone. Was it once found widely elsewhere? How has it survived here? If it was just for the font, then St Andrew would still be an essential destination for anyone interested in medieval churches. But there are several other features that, in any other church, would be considered equally essential. There is the screen. It is a bit of a curiosity. Firstly, the two painted ranges are clearly the work of different artists. On the south side are female Saints, very similar in style to those on the screen at Ufford. The artists helpfully labelled them, and they are St Etheldreda (the panel bearing her left half has been lost) St Sitha, St Agnes, St Bridget, St Catherine, St Dorothy, St Margaret of Aleppo and finally one of the most essential Saints in the medieval economy of grace, St Apollonia - she it was who could be asked to intercede against toothache. With the possible exception of St Margaret, modern Anglicans would think of all of these as peculiarly Catholic Saints, a reminder that St Andrew was built, after all, as a Catholic church. The depictions on the northern part of the screen are much simpler (Pevsner thought them crude) and are probably painted by a local artist. Note the dedicatory inscription along the top on this side; it is barely legible, but the names Margarete and Tome Felton and Richard Lore and Margaret Alen are still discernible. I think the figures on this screen are equally fascinating, if not more so. They are all easily recognisable, and are fondly rendered. With one remarkable exception, they are familiar to us from many popular images. The first is Saint James in his pilgrim's garb, as if about to set out for Santiago de Compostella. The power of such an image to medieval people in a backwater like north-east Suffolk should not be underestimated. Next comes St Leonard, associated with the Christian duty of visiting prisoners - perhaps this had a local resonance. Thirdly, there is a triumphant St Michael, one of the major Saints of the late medieval panoply, and then St Clement, the patron Saint of seafarers. This is interesting, because although Westhall is a good six miles from the sea, it is much closer to the Blyth river, which was probably much wider and faster in medieval times. It seems strange to think of Westhall as having a relationship with the sea, but it probably did. Next comes the remarkable exception. The next three panels represent between them the Transfiguration; Christ on a mountain top between the two figures of Moses and Elijah. It is the only surviving medieval screen representation of the Transfiguration in England. Eamonn Duffy, in The Stripping of the Altars, argues that here at Westhall is priceless evidence of the emergence of a new cult on the eve of the Reformation, which would snuff it out. Another representation survived in a wall painting at Hawkedon, but has faded away during the last half century. The last panel is St Anthony of Egypt, recognisable from the dear little pig at his feet. I wonder if it was painted from the life. There is a fascinating wall painting against the north wall. It shows St Christopher, as you might expect. St Christopher was a special devotion in the hearts of medieval churchgoers, and usually sits opposite the main entrance so that they could look in at the start of the day and receive his blessing. As a surviving inscription at Creeting St Peter reminds us, anyone who looks on the image in the morning would be spared a sudden death that day. It is the other figures in the illustration that are remarkable, though, for one of them is clearly Moses, wearing his horns of light (an early medieval mistranslation of halo). There are a couple of other wall-paintings, including a beautiful flower-surrounded consecration cross beside the south door, and a painted image niche alcove in the eastern splay of a window in the south wall. This is odd; it should have a figure in it, but none appears to have been painted there. Perhaps it was intended to have a statue placed in front of it, but the window sill is very steep, and it is hard to see how a statue could have been positioned there. DD surmised that there had once been a stand, the base of which was canted in some manner, and that the sill had once been less steep (the base of the painting seems to suggest this). Whatever, it is very odd. Between the painted niche and consecration cross there are surviving traces of a large painting; it seems to consist of the leafy surrounds of seven large roundels. Mortlock wondered if it might have been a sequence of the Seven Works of Mercy as at Trotton in Sussex, but there is insufficient remaining to tell. Nicholas Bohun's tomb, in very poor repair, sits in the south-east corner; an associated brass gives you rather more information than you my might think you need. A George III royal arms hangs above. If you haven't lost your appetite for the extraordinary, come back up into the apparently completely Victorianised chancel. Chalice brasses are incredibly rare, because of their Catholic imagery. Westhall had two of them, although unfortunately only the matrices survive. Then, look up; on one of the roof beams is an image of the Holy Trinity, with God the Father holding the Crucified Christ between his knees. There is probably a dove as well, although that is not visible from the ground. Indeed, the whole thing is too small, as if the artist hadn't really thought about the scale needed for it to be seen from the chancel floor. So there we are, I've let you in on Suffolk's best-kept secret. But I said earlier that I was afraid Simon Jenkinss omission of this church might have serious consequences. Here is why: there is an ongoing programme of essential repairs, and the church has had to raise tens of thousands of pounds at fairly short notice. The parish has less than a hundred people living in it, and the congregation is barely in double figures. The church is clearly a national treasure, and its continued survival is essential; but it is difficult to convince people of this, because it has been missed out of what is increasingly being treated as a heritage wish-list. It was bad enough that Pevsners books were used as arbiters of what should survive when redundancies loomed in the 1970s; it would be appalling if the Jenkins book was used in the same way now.